Dubai, UAE, October 17, 2018: There are some people in the history of sport that cannot be defined merely as ‘champions'. When they exceed the limits set by their time and enter the superhuman ‘Hall of Fame' of those who have broken all barriers by crossing the line of the inconceivable, it is then that they undergo the natural progression that turns them into legends. When, almost 30 years ago, Eberhard & Co. decided to celebrate his enterprises by creating a collection that bears his name, the figure of Tazio had become shrouded by the mists of time and all that had happened in the world of motoring since his era. It is also because of the efforts of the famous Swiss Maison and the success of the ‘Tazio Nuvolari' collection that this mist has lifted. In the past few decades, the impetuous, at times overbearing personality of a man who made his passion for sport a reason for living, placing it above all else, even above himself and those closest to him, has been brought to light. His story has inspired a great number of initiatives; books have been written, songs have been dedicated to him, and the great old-timers event that bears his name brings hundreds of fans from all over the world to his homeland every year. All this has ensured that the fame he deserves, that of being the greatest racing driver ever, lives on today. 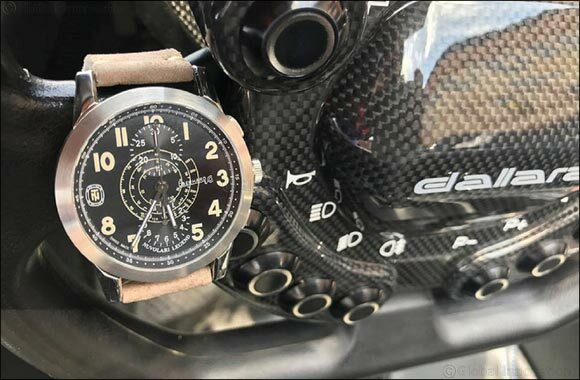 Eberhard & Co. has been the main sponsor of the Nuvolari Grand Prix for over twenty years. In this role and through the many models of watches he has inspired, the Maison has helped enormously in paying tribute to the ‘Mantovano Volante', proudly aware of the fact that the champion of technical perfectionism chose an Eberhard to accompany him in everyday life. Nuvolari Legend is an automatic timepiece with a steel case, available in two sizes: 39.5 mm and 43 mm in the Grande Taille version. The model is water resistant down to a depth of 30m. and features a black dial with luminescent Arabic numerals, a minutes counter at 12 o'clock, a hours counter at 6 o'clock and a spiral tachometer scale in km/hr in the centre. The movement can be admired through the transparent sapphire crystal base, which is secured by eight screws, decorated with a checkerboard pattern inspired by the race start flag and customised with name of the model and the historic stylised Alfa Romeo Type 12C in which the great driver obtained many victories. The ‘vintage' look of the new timepiece is enhanced by the matching antiqued leather strap. This model is also available with a steel Charme bracelet.